At first, I had trouble shaking the feeling that I had read this book before, which, logically, I know, was impossible. But within the first two chapters I realized that the characters were like old friends; Caro, Denton, "Castleton, the Stuffy Duke," Robert Townsend, even our female protagonist, heiress Anne Brotherton, were all characters that I already liked and knew well from Miranda Neville's previous efforts in this series. It was like returning to catch up with old, well-loved friends. The story of Marcus Lithgow, newly minted Viscount Lithgow, gamester, cheat, possible thief and now, desperately in pursuit of a fortune through marriage with Anne Brotherton, the heiress of Camber, starts out like the telling of Henry James' Washington Square, albeit across the pond and a century earlier. Like Morris, Marcus worms his way into Anne's heart with one goal in mind. And like Catherine Sloper, Anne ferrets out his real intentions and seeks to teach him a lesson that Marcus won't soon forget. Unlike Catherine and Morris, however, Anne and Marcus find the tables turned on both of them when their attraction grows despite their trickery. When Marcus inherits a small estate, he finds he has something she wants as well. But instead of taking advantage of that, Marcus finds a purpose in life, something honorable involving hard work and dedication that leads him back to Anne. With a marvelous plot line, this story of redemption and forgiveness is excellent reading. Like all Ms. Neville's novels, the characters are well-developed (flawed yet lovable), the secondary characters add so much, and the situations are not easily resolved. When they are however, the results are so satisfying. Highly highly recommend!! If this first novel in The Prince Catcher's series is any indication, I will anxiously await the next two books, sisters' Eleanor and Ravenna's stories. 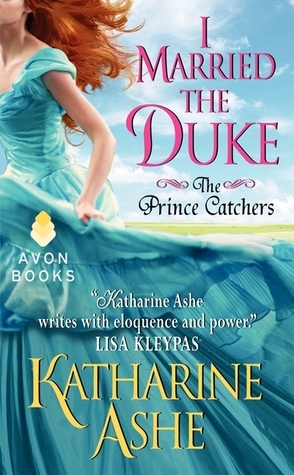 Katherine Ashe, in I Married the Duke, brings us the story of Arabella, the middle sister of three motherless daughters in search of their father after a disastrous shipwreck. With a prophesy from a gypsy woman regarding an heirloom they hold, Arabella sets off to find and marry the Prince who will lead them to their heritage. Instead of her Prince, she finds Lucien Westfall, a French Comte from his mother's side and an heir to a dukedom on his father's. An "imperfect" hero, Luc is nevertheless perfect for Arabella, despite her somewhat stringent requirements in a groom. I Married the Duke is a love story, told in fits and starts, two steps forward, one step backward fashion. Ms. Ashe weaves together the stories of two disparate and dysfunctional families into one, a paradigm for any modern marriage. Wonderful secondary characters abound. Luc's cousin Cam and his naval friend Tony move the story forward while adding necessary intrigue and dash. One hopes that these two will one day get their own happily ever afters. This novel is different in that the hero is physically impaired, and the outcome of the relationship, let alone the protagonist's individual survival, is left in doubt in many places. It's a story that's riveting, colorful and so much better for all the twists and turns. Well written, well thought out, highly recommend.